SC Szyman Poster - many can be seen around the city, keep your eyes peeled! Majgat, Republic ¥ - ul. Bracka 20. Oh? Oh, yes! 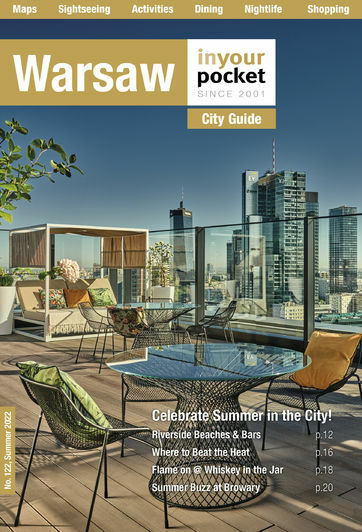 In this very guide, we've praised the virtues of the host of modernised sightseeing venues which are readily available, and the revitalised leisure spots such as the Vistulan Boulevards and artsy locations like The museum on the Vistula, but there's an altogether different aspect to the city's cool credentials, which can often be overlooked, but in equal measure brings people to this city, the aim to explore, to stare up at buildings – we are, of course, referring to the city's big collection of street murals! Huh? Yup, the city is littered with them. 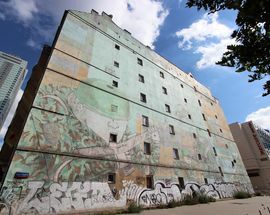 Indeed, Poland has long embraced the fact that large scale artwork and design motifs can be a fascinating and creative option for advertising or, more recently, as an outlet for the artistic visions of local and international street artists. 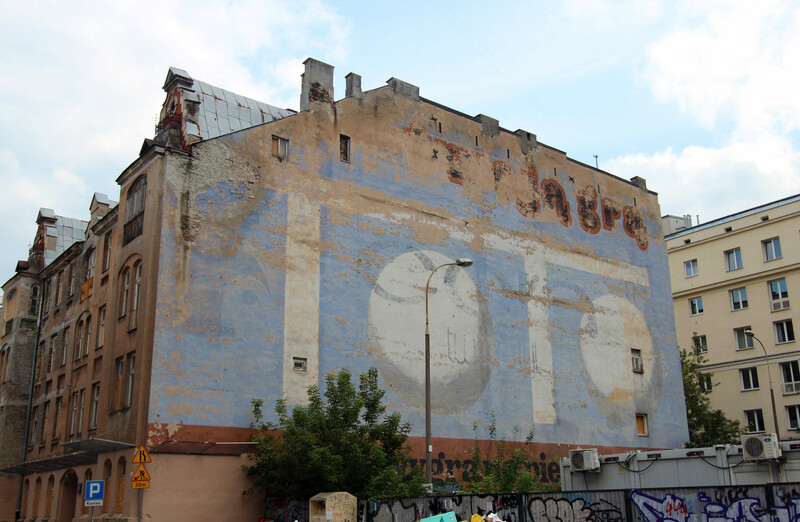 During the communist era huge advertisements were often painted onto the gable ends of buildings and factories. With the current fashion for all things retro and the undeniable coolness of Polish design from the 1960s-80s those murals which have survived till today are seen as a window into life in the Poland of old. A fine example, advertising the Toto lottery, can be seen on a vast wall along ul. Widok in the city centre; its current shabby state only adds to its sense of history and charm. With Communism in Poland long consigned to the dustbin of history, who do we have to thank for the street art and mural trend of the last decade? This is a joint accolade between Warsaw and Poland's street artists, and the organisation Fundacja Do Dzieła (Let's Do It! 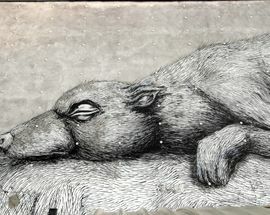 ), organisers of Warsaw's Street Art Doping Festival. 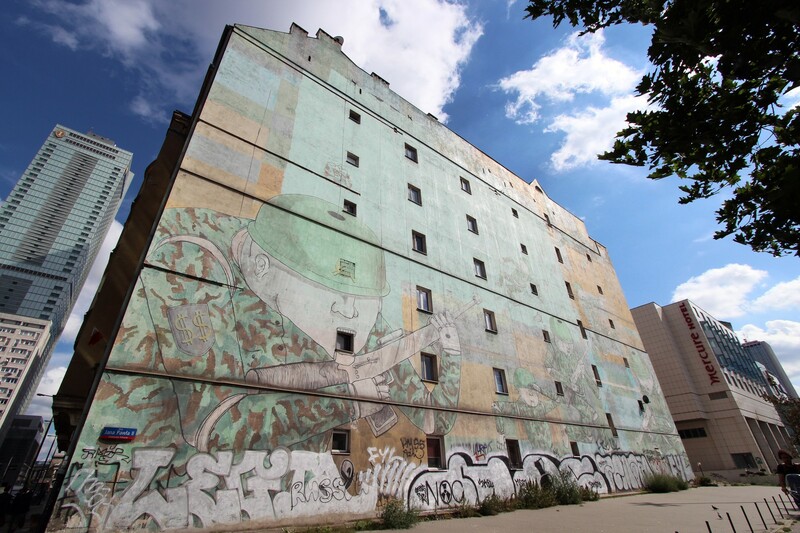 Created in 2009, Fundacja Do Dzieła took its tentative first steps, which immediately led to Warsaw's very first street art festival in the same year. 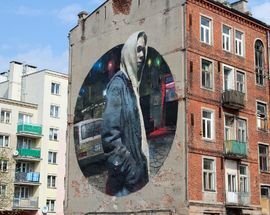 In such a short time, a whole host of international artists from Italy's BLU, Loesje of the Netherlands, Belgium's ROA, China's DALeast, to national artists such as Raspazjan, Mona Tusz, and of course, Varsovians NeSpoon, SC Szyman and Simpson have all added their creativity on many of Warsaw's buildings, walls and pillar boxes, rivalling what other cities like Berlin have to offer. As fun as street art is, what have the artists, and Fundacja Do Dzieła accomplished? 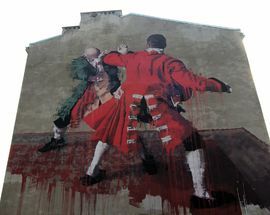 First off, you simply need to visit all the street art sights to see the full extent of the work – the answer is plainly painted on the walls! 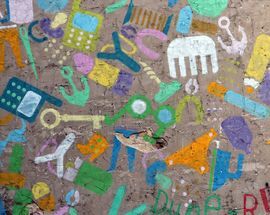 For as much as the city has regenerated itself through infrastructure projects, and fresh licks of paint here and there, it's the other type of paint, often the one from cans, which can be overlooked. The cultural diversity displayed on the streets of Warsaw is vast and shows how a city can change its fortunes in such a short time to become one of positive change. Plus, a lot of these pieces are simply nice to look at - they're pleasing. 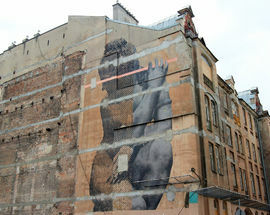 While Fundacja Do Dzieła has been a celebrated success, in other cities, such as Berlin, there is an ongoing debate about whether street art has been appropriated by authorities, another form of gentrification that counters the original intentions of the artists and purposes of the murals. 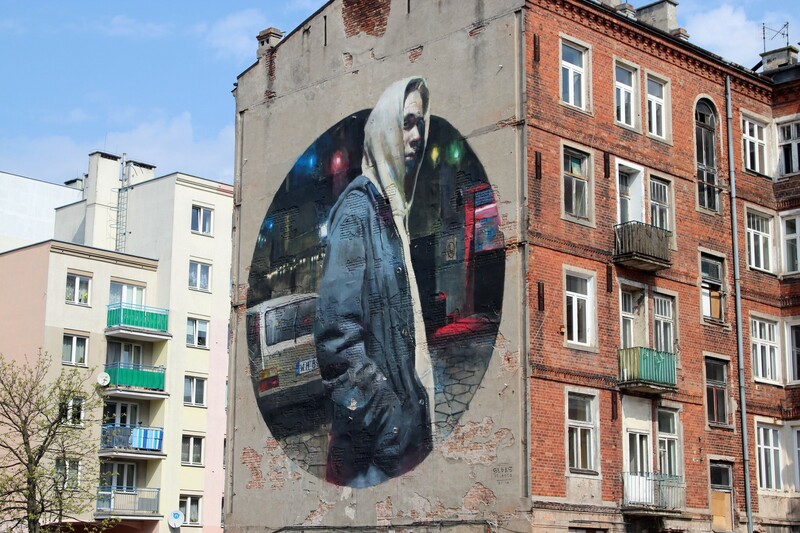 Warsaw has employed the talents of street artists to create public art in the service of the re-invigoration of the city, and nowhere is this more evident than in the Praga District. Although it can be argued gentrification is sinking its claws into the area, there is an element of success with street art, as two important factors act as a drive – to respect the work of the artist while adding value to a neighbourhood and the community of people that live there. And, of course, the work being available for all to see for free. Stick to these principles and the beast of gentrification may be kept at bay... although having a big stick may also help! 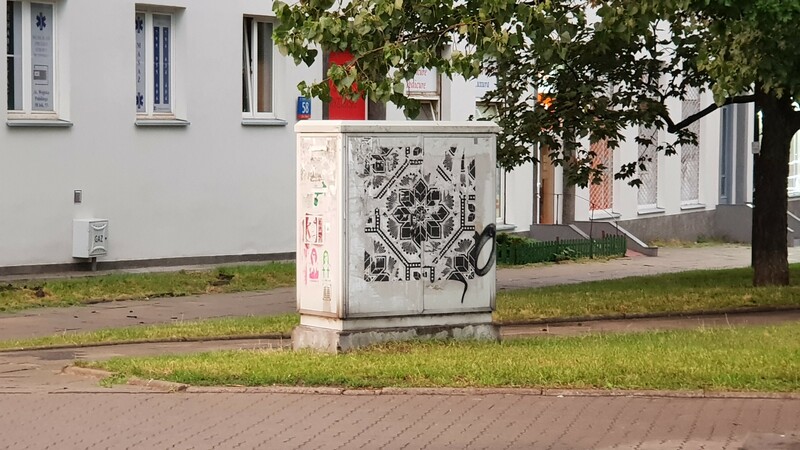 At any rate, those with an interest in street art will have little trouble tracking it down in Warsaw, and we’re making it even easier. We fully encourage you, especially in these warm months, to see as much of the murals, and street art installations, as you can. It's a pleasant adventure in itself as you inevitably get to see the city for yourself, including parts you would not otherwise have considered going. In addition to cataloguing and GPSing street art addresses throughout the city in our online street art section, we’ve also marked each location with a spray can symbol on the maps in the back of our guide, so you can literally use them to give yourself a tour of Warsaw's urban art. As for online, we've even listed all pieces of street art, old and new, to keep you informed if they still exist or not, to save you time from visiting a site, only to discover that once fantastic mural has been painted over, or worse, the building it was on is gone (if you find that piece has been painted over since we've last been, please, do let us know)! 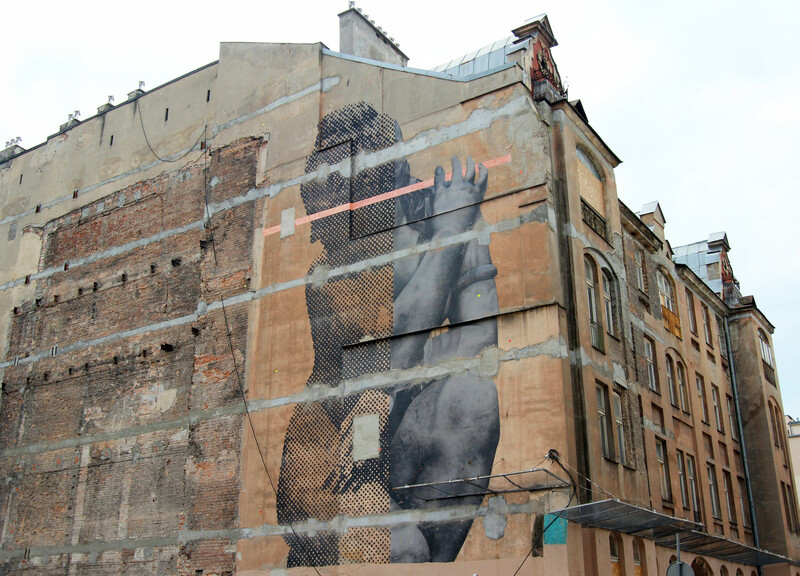 Although street art can be found throughout the city, if you're limited on time, your best bet is to head on over to the city's Praga district (p.50) on the east side of the river. 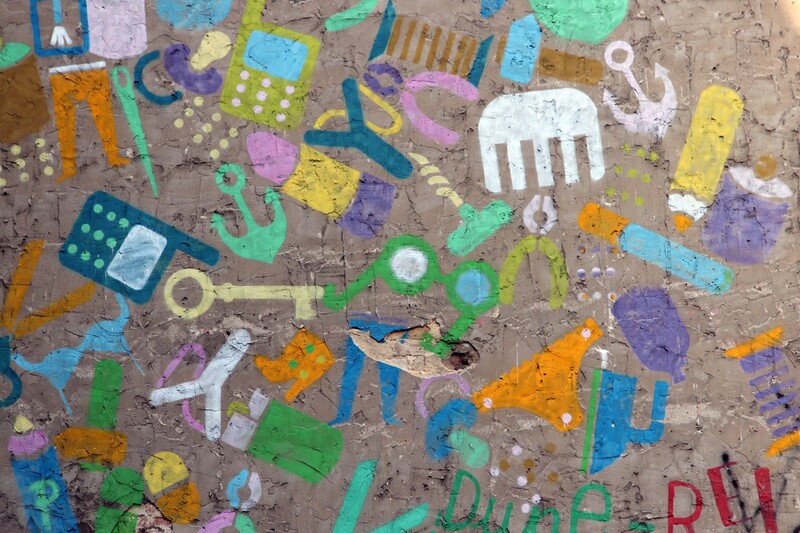 Examples of some fantastic murals can be seen at ul. Racławicka 17, ul. Rakowiecka 2C and ul. Bliska 23 (in Praga Południe) respectively, also, if you stick to the length of ul. Stalowa, to your left and right, you'll frequently see murals. 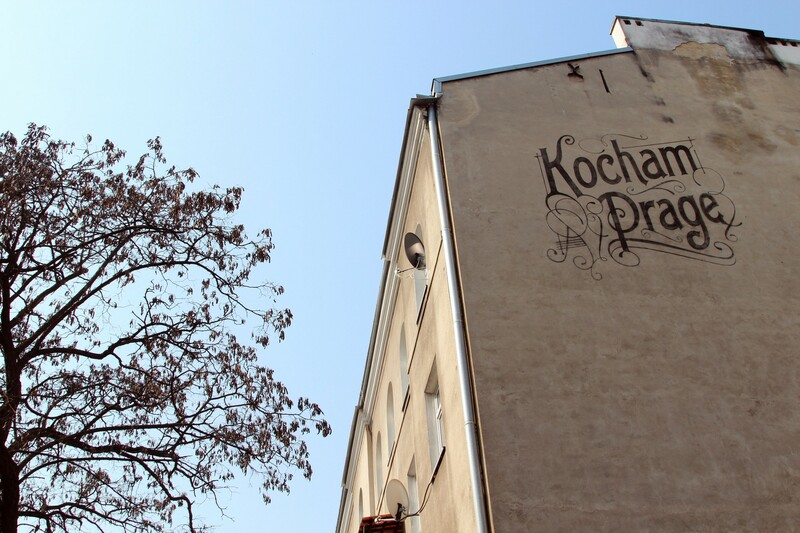 If you have even less time to venture to Praga, then not a problem, for even in the city centre you can still see quite a few pieces of street art before leaving Warsaw. In the aforementioned ul. Widok we already mentioned some communist-era advertising, however, just across from it you'll also see a mural depicting a statuesque woman. Continuing onward to ul. 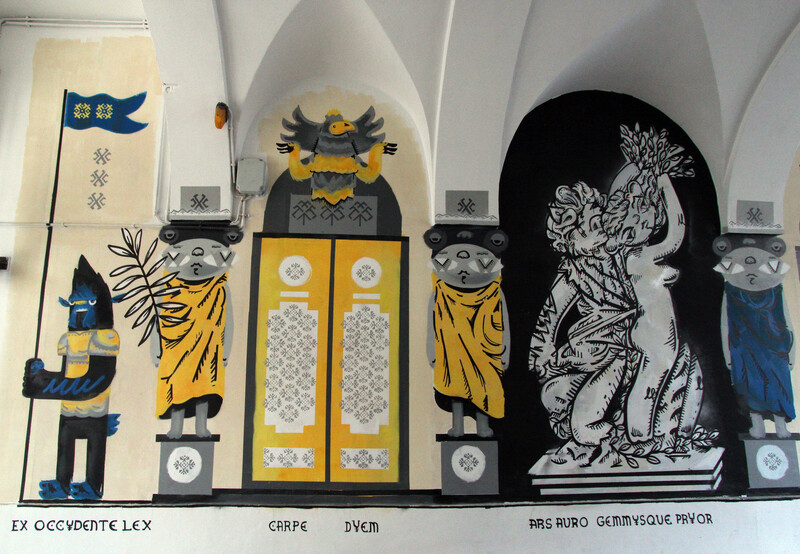 Bracka 20, in the courtyard gate, you'll see a storyboard mural from Polish artist Majgat, depicting a fantasy world called Republic ¥. Exiting the courtyard, turn right, and continue a short distance to ul. 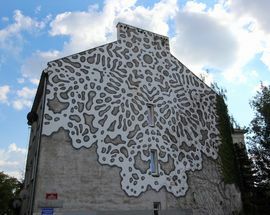 Szpitalna 6, enter the courtyard to see a Multi-eyed Tree (yup!) by Otecki and Hemoroid (again, yup!). You are also bound to stumble across some rather fine and less ‘in your face’ little creative acts, and although they are not marked on our maps, they are everywhere and usually last a few months! 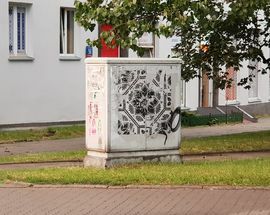 We particularly like the painted and stencilled gas and electricity boxes which are dotted around town - keep your eyes open for the projects of sweetly subversive local heroine NeSpoon; her stencil series - based on motifs of traditional Polish lace designs - is often seen in the unlikeliest of places. SC Szyman's poster designs, often showing weapons like AK-47s and grenades, are often found around the city, lasting as long as the elements will allow them! If you have more time, then visiting Fort Bema is highly recommended. 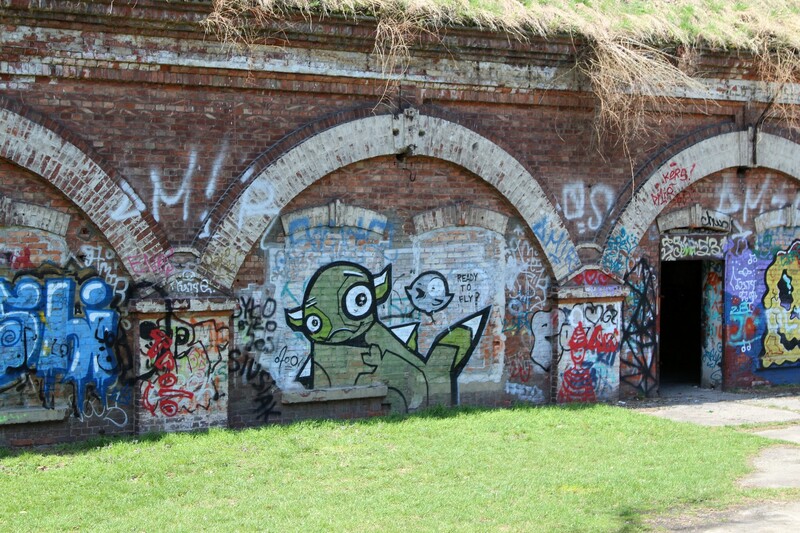 Found in Warsaw's north-western district of Bemowo, this complex of now abandoned Tsarist era fort buildings within a park has become somewhat of a mini-Mecca of street art in Warsaw, not often visited by tourists! Treat it as a walkthrough gallery. To get there from the main Dworzec Centralny train station (bus stop in front of the Palace of Culture and Science - the big pointy building! ), take bus 109 and switch at Monte Cassino bus stop to bus 197, which will take you straight there. As with all outdoor street art, it's best to be quick when going to see some murals, for one of our favourite murals of a Castle in the Sky, once located on ul. 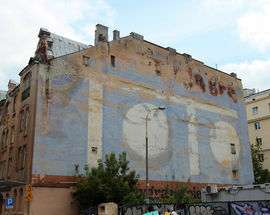 Mińska 12 (Praga Południe) is no more - gone with the building it was painted on! 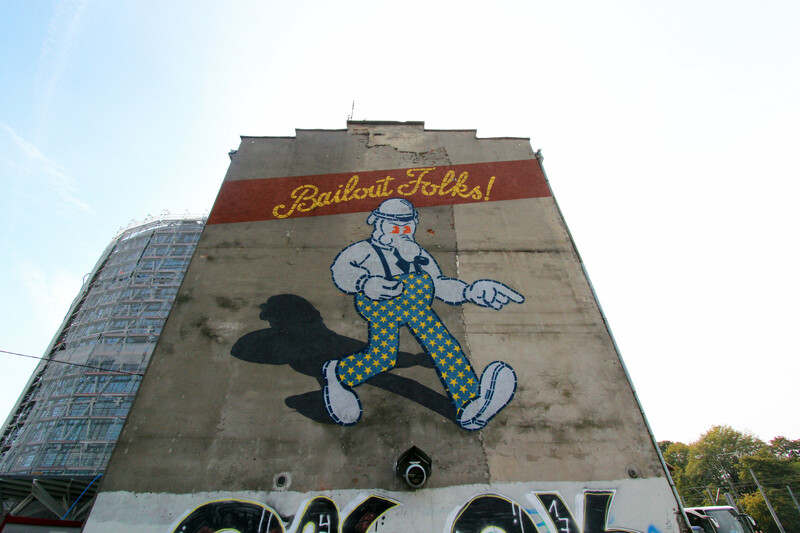 And so it comes to pass, murals are often painted on derelict buildings, or buildings marked for demolition to make way for some fancy development (stay back, gentrification, stay back! ), so it's quite hard to tell how long the artwork will last. 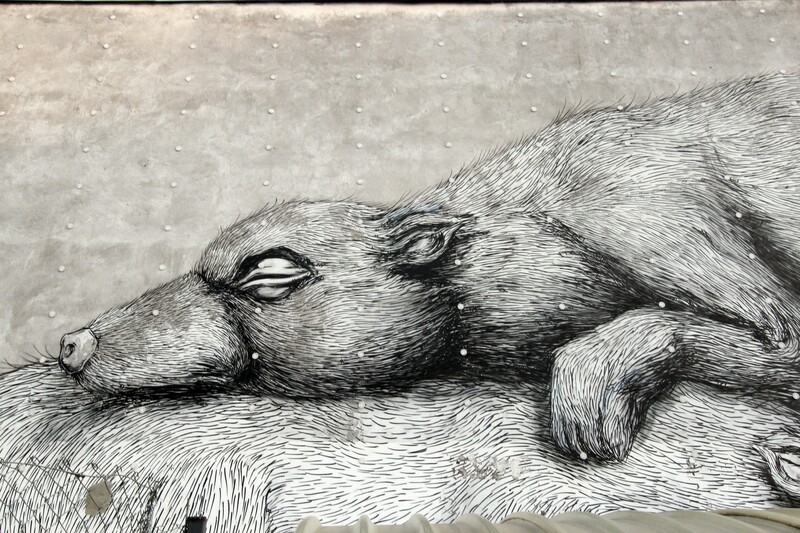 But fear not, for more murals pop up in the city than are lost to us. They can't destroy them all! 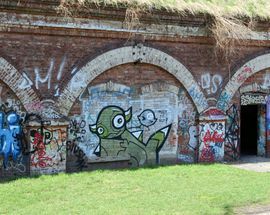 The location of Hydrozagadka, the walls around it are covered in murals and various pieces of crazy art. It's all great! 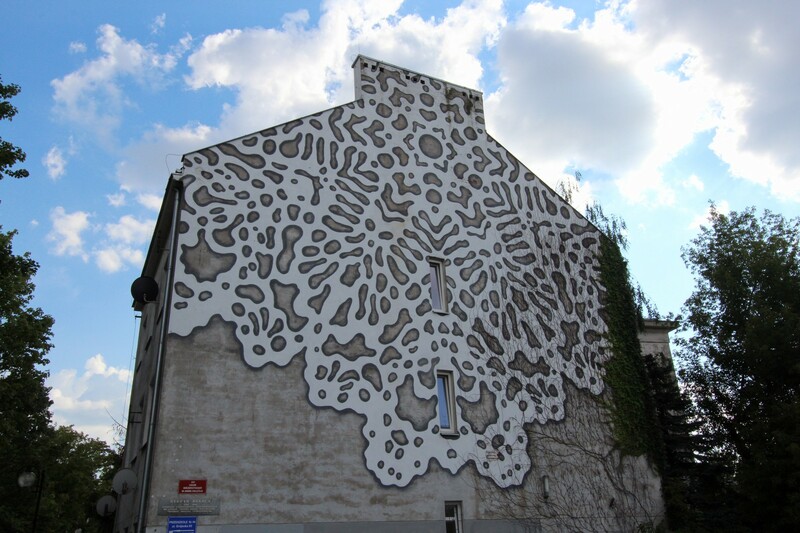 This work was created by artist Swanski in 2011 to commemorate Maria Skłodowska-Curie who was raised in Nowolipki. Created by Polish artist Simpson. 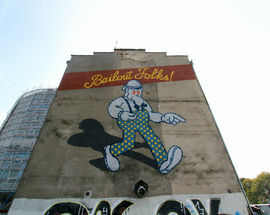 Captain America (no, not that one) mural created by Simpson in 2012. 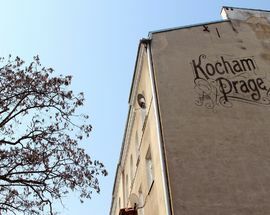 Created by Krzysztof Bagiński in 2010, the mural reads 'Chopin in Warsaw'. Created by DALeast in 2014. 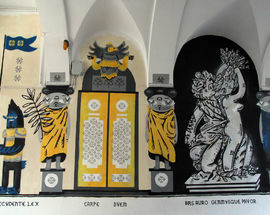 Created in 2012 by Diego Miedoin collaboration with local schoolchildren. The effect is a goose in a surreal setting! Found on practically every pillar of the flyover, there's a mix of everything here from crazy art to Legia Warsaw graffiti, all from various artists. Created by Italian artist Pixel Pancho in 2012, this piece shows a mechanical centaur killing a mechanical deer. Enter the courtyard to see a Multi-eyed Tree (yup!) by Otecki and Hemoroid (again, yup!). Created in 2012. Created by artist Swanski in 2017 to highlight the state of the world's oceans, as part of the UN's World Oceans Day. Created in 2016 by artist Alicja Biała. Created by artist DOME in 2013, depicting quite a surreal scene! 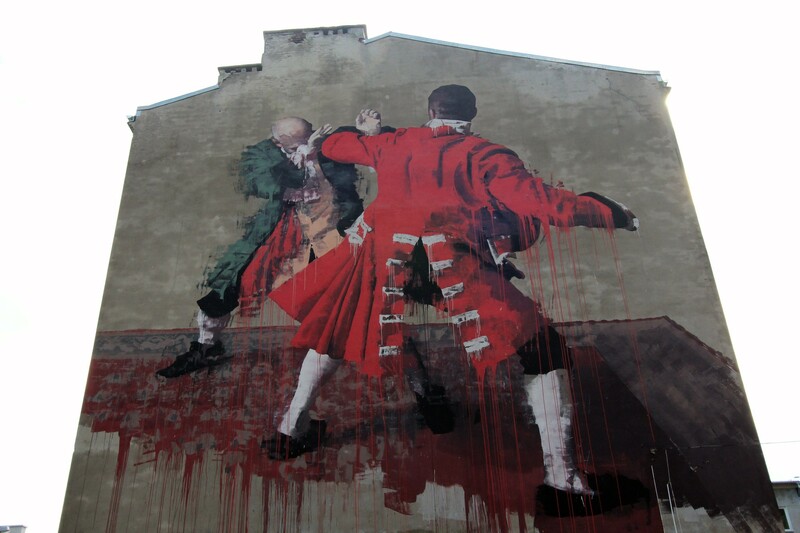 Created in 2015 by Irishman Conor Harrington as part of the Street Art Doping Festival. Created by Adam Walas and Anna Koźbiel. This is Henryk Nowak from the book 'Zły' (Bad) by Leopold Tyrmand.